One year ago, in Rio de Janeiro, in the 124th minute of the World Cup Final, Bastian Schweinsteiger hit the deck once more. By the time he dragged himself to his feet for the umpteenth time that evening he was a world champion. Mario Götze may have won the game with a flash of his left boot in extra time, but Schweinsteiger’s performance for the 114 minutes prior to the goal and the 6 minutes following it were arguably just as important. Battered and bruised and barely able to stand, Schweinsteiger clung to his teammates at the final whistle, the back of his number 7 shirt stained with the grass of the Maracanã and the blood, sweat, and now tears of an epic battle. A year on, he is heading to Old Trafford as the first German to play for Manchester United. Due to his near omnipresence in Bayern Munich’s and Germany’s recent footballing history, Bastian Schweinsteiger’s move to Manchester almost has a similar feel to Gerrard’s and Lampard’s switch to MLS – namely a highly decorated club legend playing out his last season or so in new surroundings. The difference, of course, is that, at 30, Schweinsteiger is considerably younger than his USA-bound contemporaries. And whoever Louis van Gaal goes on to bring in this summer, he may have just made his best signing of the season already. Although this move could have happened a couple of years earlier, getting one of Bayern’s most iconic players whilst he still has a lot to offer represents a real coup for Manchester United. You have to wonder if he would have been allowed to leave had a German been in charge of the team, and not Pep Guardiola. Van Gaal is reportedly also interested in Thomas Müller (well, who isn’t? ), but a move for him would be highly unlikely. Nevertheless, levering an icon out of the Allianz Arena is testament to van Gaal’s reputation, and probably would not have happened under Moyes. Plus, if it works out for Schweinsteiger, who’s to say more will not follow? Arsenal’s capture of Mesut Özil is a case in point. Like all good players, Schweinsteiger has evolved – not only over time, but under different managers. Just as Pirlo switched from attacking midfielder to regista, or Franz Beckenbauer, also originally an attacking midfielder, dropped even further back to become a pioneer of the libero role, Schweinsteiger’s game has developed. 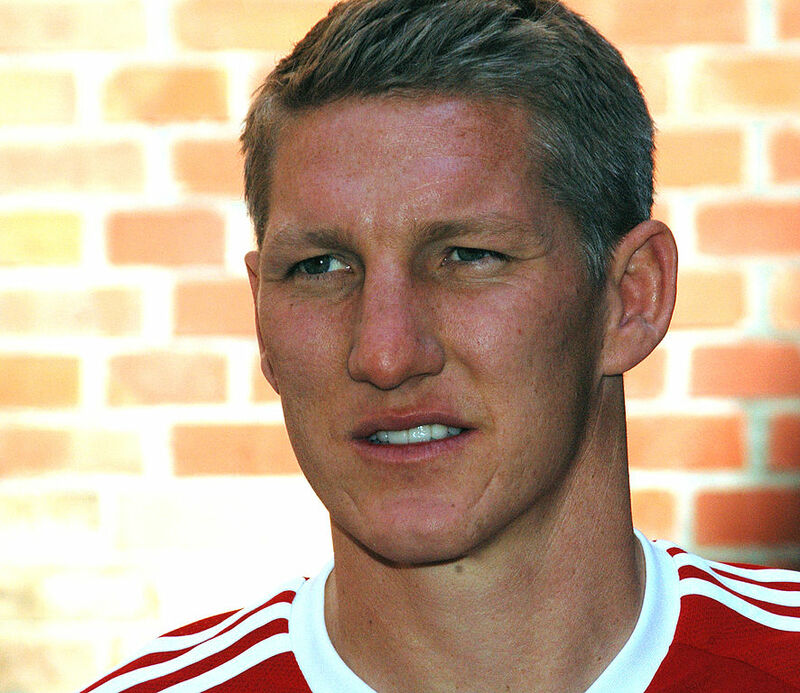 As he broke into the Bayern Munich and Germany first teams, Schweinsteiger was a left-winger. He loved to run at defenders and, being predominantly right-footed, often looked to cut inside and get off a shot at goal – as he did to devastating affect against Portugal in the World Cup 2006 third-place playoff. However, as the football public in England will be all-to-aware, Louis van Gaal does not accept the pre-defined positions for his players. And although his tweaking at Old Trafford hasn’t really paid dividends as yet, his work with Schweinsteiger, although simple, was staggeringly effective. Van Gaal explains that when he joined the club, he spoke with each player individually about their role in the team, and for the Dutchman it what was clear to see that Schweinsteiger was not a left winger – despite having enjoyed success in the role for club and country. Van Gaal convinced him to switch a central position as part of the Doppelsechs on the side of enforcer, Mark van Bommel, where he thought his intelligence and ability to read the game would be best exploited. Van Bommel provided the metal; Schweinsteiger the guile. Schweinsteiger has come a long way since being part of the Schweini and Poldi double act of the 2006 World Cup with Lukas Podolski. The bleached blond, spiky hair has given way to a short crop, greying at the temples. Schweinsteiger has come a long way since being part of the Schweini and Poldi double act of the 2006 World Cup with Lukas Podolski. The bleached blond, spiky hair has given way to a short crop, greying at the temples. And following the international retirement of Philip Lahm, Schweinsteiger’s increasing importance to the national set-up peaked when Löw promoted him to captain. Back at Old Trafford, the departures of Roy Keane and Paul Scholes have left chasms and the failure to replace the two has been lamented. Of course you cannot ever truly replace a player; that’s what makes players into legends. Generally, attempts to sign like for like end in failure. Manchester United may have enjoyed some early success with Javier Hernandez as a relatively cheap signing who was effective coming off the bench – but in no way was he seen to replace Ole Gunnar Solskjaer, for example. The key is to bring in players that can, at least, help to offset the loss of quality, influence, goals, etc. a departed player has taken, or better still, improve the team and take it forward. Schweinsteiger is neither the second coming of Roy Keane nor Paul Scholes. Nevertheless, he possesses qualities that may finally offset the loss of both. With increased responsibility for both club and country has come a greater physical presence on the pitch, a steeliness. The time of the enforcer has arguably gone, but in Schweinsteiger Manchester United now have another player in the center of the park who can, and will, make a tackle. Better still, he is able to recycle possession by quickly shifting the ball on to teammates – which may go a way to altering the often-criticized static nature of the team’s play last season. What’s more, Schweinsteiger is a legend for club and country. He has won multiple Bundesliga titles and domestic cups, the Champion’s League and other honours in a seventeen-year career that saw him make 500 appearances. Regardless of how effective Michael Carrick can be, and to what extent Ander Herrera has grown into his role at the club, having a player of Schweinsteiger’s stature in the team will have a psychological effect on his own teammates and the opposition – and it is arguably in this respect that Schweinsteiger can most compensate for the loss of players such as Scholes and Keane. Like the United legends, Schweinsteiger has overcome disappointment, such as missing a penalty in the 2012 Champion’s League final against Chelsea, and he is a winner. You don’t win over 100 caps for Germany and rack up so many performances for Bayern Munich unless you are a special player. His record will afford him respect amongst his peers and some bedding in time with the fans. His longevity should not be confused with antiquity. Schweinsteiger is a similar age to Ballack when the then Germany captain signed for Chelsea, and he is younger than Andrea Pirlo when the Italian maestro revitalized his career at Juventus after being shown the door at the San Siro. As it stands he is perfectly placed to become a linchpin in Van Gaal’s reshaping of Manchester United – a Mercedes Benz in the engine room. Players will often cite the need for a new challenge when moving on, particularly when they have become so ingrained in a club’s fabric, as Schweinsteiger is with Bayern Munich. And while this may often (but not always) be empty rhetoric, in Schweinsteiger’s case it appears to be this very challenge that has forced his hand. It would have been easy to see out the last year of his contract and let the offers roll in. After all, he would still have been an important player and would have been almost guaranteed success, domestically at least. On top of that, as captain of the national team, he would have had the chance to train and play with many of his teammates on a daily basis. However, the Bastian Schweinsteiger story has already seen challenges and disappointment, highs and lows. And now, as he switches to Old Trafford, this looks very much like a new chapter of his footballing story rather than just an epilogue.